When choosing a summer camp for your child, there are many factors to consider. What does the camp teach? Where is it located? Is it fun? And one of if not the most vital question: Is my child safe? iD Tech has been in business since 1999. 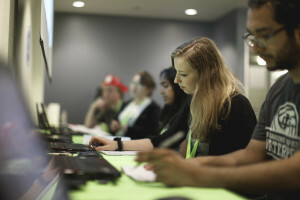 As the world’s #1 summer STEM camp, you know we know our stuff when it comes to cutting-edge tech, a balanced learning experience, and a unique culture. But beyond all that, beyond the laptops and the games and the dress up days, is our commitment to ensuring the safety of every single camper who enters our care. We have maintained continuous accreditation with the American Camp Association (ACA) since 2001. The ACA is an independent organization that reviews camp operations and is the nationally recognized standard that focuses on program quality, health, and the safety of a camp’s operation. The ACA partners with the American Academy of Pediatrics, the American Red Cross, and other youth-focused organizations to ensure these standards are not only met but are up-to-date and research-based. This means the standards iD Tech adheres to are straight from the professionals who have done and keep doing the research necessary to ensure we’re always running top-of-the-line programs. But what does that really mean? For starters, the ACA has more than 60 years of history and parent trust behind it. It also means we comply with the ACA’s more than 300 health, safety, and program quality standards. It means we’ve gone to great lengths to meet these standards, have been evaluated by outside organizations, and have passed the test. You know about our amazing instructors already, how they take their extensive tech knowledge and use it to inspire the next generation of innovators in our quirky culture of inclusion. What you may not know is how selective we are when hiring our summer staff. Our standards are high: adults only, no unpaid counselors-in-training; studying or already a professional in their STEM field; prior teaching experience heavily weighted. For the applicants who pass those initial requirements, we then run extensive and thorough background checks and ask for multiple personal and professional references, mandatory for every single staff member. Is it a ton of paperwork? Of course. Is it worth it? There’s no question. But the application process is just the beginning. Because we run camps all over the world, we have an extensive Operations department including full-time Regional Managers who conduct multiple interviews to ensure every potential hire has the right personality, skill set, and love for what iD Tech does. You might think we’d be done there. We’re not. Each year, we fly, train, bus, and drive every single potential member of summer staff to in-person Regional Staff Trainings (RSTs) where they participate in a three-day crash course in learning how to bring the magic — and yes, safety — to every iD Tech location across the globe. The well-being of our students and staff is worth the extra miles. These Trainings also serve another function: those same Regional Managers attend every single one and meet their hires in-person. It’s the final “interview” and, even though the Trainings occur right up to (and sometimes into active camp season) sometimes there are staff who don’t make the cut. Only the best and most trusted staff receive the privilege of teaching your child. Eighteen summers and more than 275,000 alumni speaks for itself. iD Tech welcomes, houses, teaches, and inspires more than 50,000 students each summer. And each summer, we send those bright, engaged students back to their families in better condition than when we checked them in.